D-Business travel tech incubator has acquired Bôtelier start-up to integrate it into AdsHotel and in this way, create the first algo-trading solution for the hospitality advertising and sales. Artificial Intelligence is the technology core of Bôtelier’s distinctive distribution. By adding it to AdsHotel the goal is to optimize Advertising Campaigns with machine learning capabilities in order to increase the actual performances of AdsHotel platform, which already generates +5ML € of hotels’ bookings per year. AdsHotel was founded in 2014 in Venice, Italy by Marco Baldan, Filippo Fasolo, Marco Bonaso and Massimo Trovo, and it was launched to let hotels manage all the meta-search PPC campaigns from a one-stop solution, within a unique platform. AdsHotel features Meta search optimisation to bring direct sales to hotels at the best possible conditions. Certified worldwide by Google HPA, Tripadvisor, Trivago, Kayak etc. AdsHotel is today’s leading meta-search management platform for coverage of connected Metas, usage of their bidding multipliers and for its unique financial budgeting model. Bôtelier start-up, launched in 2016, is one of the first proofs of the capabilities of algo-trading powered distribution for the hospitality industry. 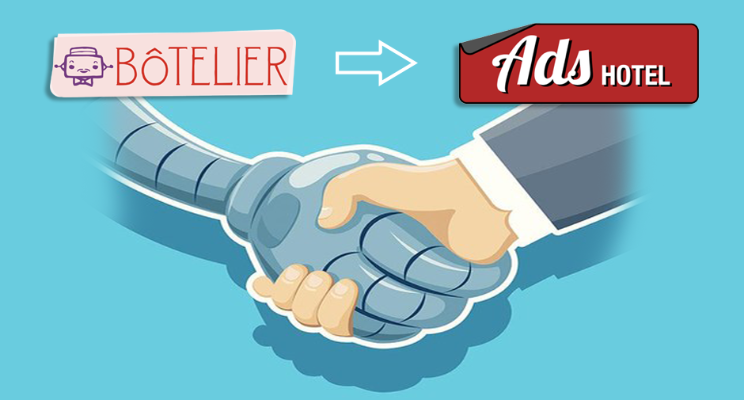 Thanks to its AI engine with distinctive distribution model, Bôtelier project self-learns the different moments of hotel sales and optimises the acquisition leverages of them among the different distribution channels: i.e. the secret sales (including retail travel agencies), the programmatic advertising and the Meta search. Bôtelier’s founder, Osvaldo Mauro, will join the AdsHotel team of co-founders and will get a leading role in the development of the AI technology for hoteliers. “Bôtelier artificial intelligence start-up is the peak target of my long experience as a researcher and innovator in the travel tech field” said Osvaldo Mauro, co-founder and CEO of Bôtelier. “With the merge into AdsHotel, we gain the missing link with the best Meta search bidding engine and the big data from its established connections. Starting from my experience in OTAs such as lastminute.com , trough Travel Price , Tui and in the growth hacking for independent hotels, I’ve understood that hospitality distribution is a trading market in which only the machine learning can seamlessly master the different leverages for customers acquisition.”. The $176 B hospitality market continues to grow mainly in the digital arena, with today’s acquisition, following a series of big moves in the artificial intelligence space. For instance, $182M funding for the AI start-up in the business travel niche trade shift , $44,7M raised by ex-Kayak funders for their new start-up called Lola, €26,6 M raised by bid data analytics SnapShot GmbH.